The Flea Circus Research Library's look into the microscopic world of educated and trained fleas. In my research into trained fleas, I came across Painted Fleas or Pulgas Vestidas, I've quizzed a few experts on why they are made. The natural history museum passed on the following article that was first published in an edition of Flea News by Frans Smit from the Rothschild Zoological Museum at Tring. Just a small point - the fleas themselves are not actually dressed, they form only the head of the tiny figures. They are amazingly detailed considering they are hand-made, probably without much magnification and best appreciated under a microscope. Tring has the peasant couple (2 fleas) and the NHM (not on display) two bridal couples accompanied by a 6-piece Mariachi band (10 fleas). None are more than a 5mm tall. In 1910 the Hon. N. Charles Rothschild was offered a fine collection of fleas from Mexico - in those days quite a terra incognita as regards these insects. To his intense disappointment (but surely to NCR's amusement) the collection proved to consist of twelve dressed fleas, known as pulgas vestidas. They consisted of two "peasants", a man carrying wood and a woman with a basket which form one of the more popular exhibits in the public galleries at Tring Museum. 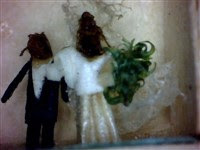 The other is a set piece comprising two brides and bridegrooms with a Mexican band that now reside in the Entomological collections of the British Museum (Natural History) in London. This week I received an email telling me about big collection (pun not intended) of these fleas, 12 in total on sale on the Canadian Ebay. Each box is 2 match heads high by 3 match heads wide. Each doll's head is a flea, and each color of material is a different material. there are 2 different displays. All photographs and microscope images are from actual items on auction. Photograph with Canadian $2.00 coin for scale. B) Farmer and wife 1 (x 5, Pink clothes) male dressed with sombrero, and carrying a bail of wood, and female in Mexican traditional head dress. D) Bulk packaging (outer packaging for 12 pack (7x bride and grooms, 5x pink farmer and wife) Scribe on side of box Indios (in Spanish meaning Indians – to the best of my ability). The outer package is in good to poor condition, but has protected the 12 inner displays, to a pristine quality. As with everything in the flea circus world the history of Pulgas Vestidas is wrapped in flamboyant stories with suggestions that these were made by nuns or monks being common. The sets nearly always seem to be related to marriages so perhaps there is a religious connection. The seller does have evidence that dates the items back to 1920s so we can be fairly sure these items are pretty old. Follow everything about Flea Circuses on Twitter Now!